Set in 1918 and written in 1976, “In the Waiting Room” – set in another of Bishop’s childhood locales, Worcester, Massachusetts – also tells a tale of an experience that is common to everyone: coming into conscious awareness of oneself as a separate person, a being who can feel pain, alone in a large and often alienating world. What is not at all common is young Elizabeth’s awareness of this moment of coming into consciousness. Is the young Elizabeth aware of this as it is happening? Or is it the older adult Elizabeth who looks back and recognizes what this moment was? Or is the young Elizabeth perhaps in a kind of conversation with her adult self who seeks to make meaning out of a “strange” experience? Young Elizabeth – about to turn seven in just three days – sits in a waiting room while her Aunt Consuelo has a dentist appointment. Surrounded by “grown-up people, / arctics and overcoats,” the young girl picks up a National Geographic (with its classic yellow border). She pores over photographs of the inside of a volcano, the explorers Osa and Martin Johnson (“dressed in riding breeches, / laced boots, and pith helmets”), and “[a] dead man slung on a pole,” captioned as “long pig,” presumably destined to be eaten by cannibals. Most startling, however, are the “[b]abies with pointed heads / wound round and round with string” and the “black, naked women with necks / wound round and round with wire,” women with “horrifying” breasts. No matter how many times I read this poem, I will never cease to be amazed at how deftly Bishop depicts the common, but extraordinary, experience of coming into an awareness of self. As in “The Moose,” she isolates a powerful moment in time – the type of moment too many of us overlook or experience in such a fleeting way that it is nearly forgotten. Bishop provides the freeze-frame, tells us to stop, pay attention. If you want to read more of Bishop’s poetry, you’ll want to take a look at The Complete Poems: 1927-1979 as well as the Library of America volume Elizabeth Bishop: Poems, Prose, and Letters . In addition, One Art , a volume of Bishop’s letters, is indispensable reading for those who like to get the inside skinny on writers and their lives – and you’ll also love Lorrie Goldensohn’s outstanding book, Elizabeth Bishop: The Biography of a Poetry . Earlier this year, a new Bishop biography was published. Megan Marshall’s Elizabeth Bishop: A Miracle for Breakfast draws on a collection of letters Bishop wrote to her psychiatrist in 1947, letters previously unknown by Bishop scholars. If you’re not up for reading the entire biography, you might read an excerpt from Marshall’s biography. Published in The New Yorker, the excerpt – “Elizabeth and Alice” – focuses on Elizabeth’s last love affair. The New Yorker also published an insightful article about Marshall’s biography. “Elizabeth Bishop’s Art of Losing” accurately describes Bishop’s closely guarded personal life as “harrowing.” Bishop’s psychiatrist told her she was lucky to have survived her childhood. That she did so speaks perhaps to Bishop’s personal strength and resilience. In a poem like “In the Waiting Room,” we see the commanding mind already at work, even in a young girl just about to turn seven. 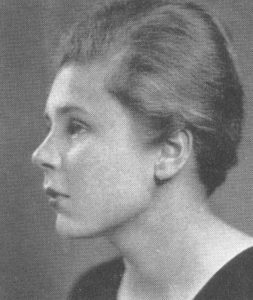 I highly recommend these poems about Elizabeth Bishop’s youth – “The Moose” and “In the Waiting Room.” Though she published only about one hundred poems in her lifetime, they are powerful poems indeed and well worth reading. There was a wonderful movie made about the period of her life when she lived in Brazil, called Reaching for the Moon. Thanks for the reminder about this interesting poet!